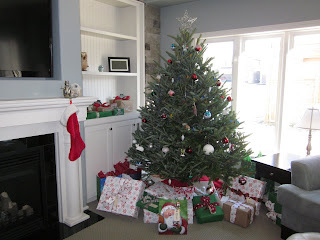 Since it's Christmas Eve AND I just found the missing SD card... here are some pictures of our first Christmas tree. I think it was a learning experience for us... When I cut the netting around the tree, it reminded me of this clip. 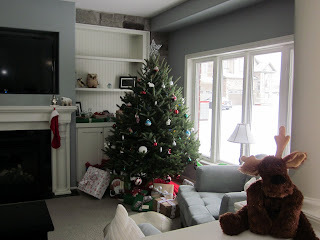 It was a little hard to get a good picture of the tree since it's white outside (not as white as I wish it was!). And here it is lit up. I'm not sure I'm totally sold on the colored lights. 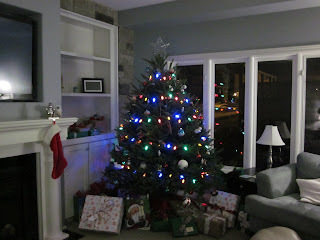 I think we might try white lights next year. I don't know. The colored lights seem more traditional to me. Either way, I love it!